What inspired you to become a Legacy donor to Chabad of Tustin? I was inspired by our Rabbi and his energy and determination in reaching out to Jews across the community; I was inspired by his vision for our congregation and our Shul. I made the decision to leave a monetary gift to Chabad of Tustin when I was having a living trust assembled. For me, it was the perfect time to make a definite commitment to support our Chabad Center. When you think of Chabad of Tustin, what key words or phrases come to your mind? My first thought is ‘My Jewish family’. I feel that our shul is an extension of my own family, and its members - my fellow Jews - keep the shul alive and moving forward. In short, our close friendship and admiration for my Rabbi and his family. Performing Mitzvot, Learning Torah, Davening on Saturday mornings, and immersion in the entire Chabad experience, from Tustin to Crown Heights. What was the single most important consideration in your decision to make a Planned Gift to Chabad of Tustin? Is Chabad an ethical, honorable Jewish entity? If I make a monetary contribution to Chabad of Tustin, will the gift be wisely and appropriately used to further Judaism and to attract older and younger members? After getting to know Rabbi Shuey and Rebbetzin Blumi, I feel very much at peace with my decision to make a Legacy gift to Chabad. Is there an important moment, person or special occasion at Chabad that influenced your decision? Yes. 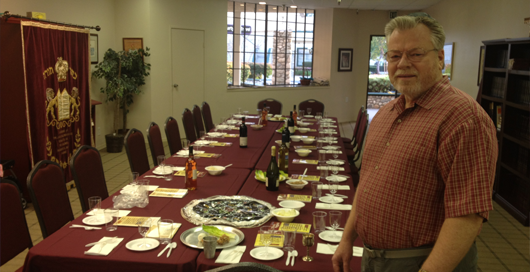 My first Saturday at Chabad of Tustin, when I was called to the Torah by Rabbi Shuey. No sooner had I sat down with the other congregants than Rabbi Shuey called on me and asked for my Jewish name. I told him. Then he said: ‘Have you ever had an aliyah from the Torah?’ I replied, ‘No, I haven’t.’ He told me, ‘Well, today’s your lucky day.’ And it turned out he was right.